Lino Ieluzzi, the owner of Al Bazar in Milan, the men’s clothing store on Via Scarpa, 9. His shop is one of the points of reference for masculine elegance for customers now coming from all over the world (especially from Japan) . His ties with the number 7 are the characteristic “cabalistic” that distinguishes his shop. 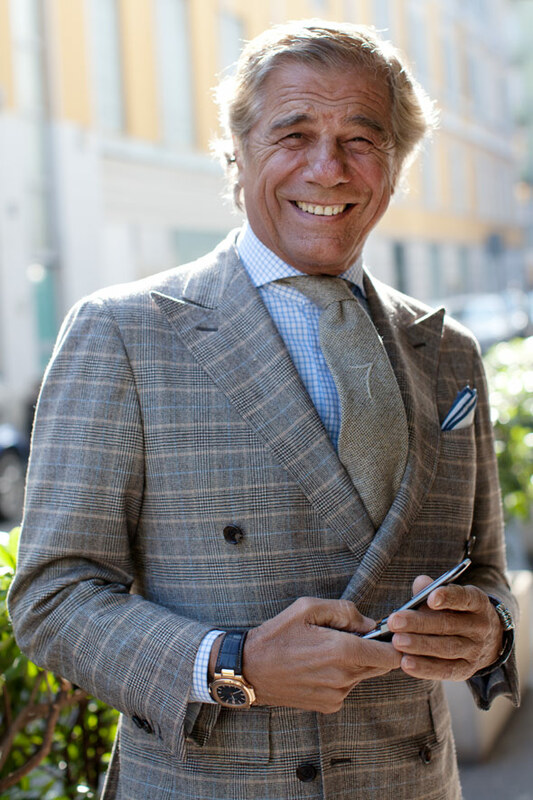 His unmistakable style is the identifier that distinguishes in the world, the perfect Italian gentleman. Welcome Mr. IELUZZI. I am so very impressed with the choice of styles, colors, lines, as well the detailing in the line of clothing presented in these photographs. The choice of accessories that have been chosen compliment the styling of the outfit and bring more personality to them. His style is so unmistakable and clearly shows the outstanding and fantastic craftsmanship/workmanship of clothing that also bear the label MADE IN ITALY. And it also the mark of a true Italian Gentleman. It proves that one can’t compare any other item of clothing made somewhere else, they pale in comparison. Brava Mr. Ileuzzi. It is a pleasure to have you as a major player on the fashion stage and I look forward to seeing much more in the coming years of your workmanship and product.